This is just my Shoemoney network review. I discovered Jeremy Shoemaker’s blog titled Shoemoney a few years ago. What I enjoyed the most was reading about his journey as an internet marketing millionaire. When I learned about his brand new affiliate network I was quick to join. But like most people I never did anything with my membership. A few weeks later, I received an email from Shoemoney about his new passion project. His basic idea was to pay you to complete some basic tasks. 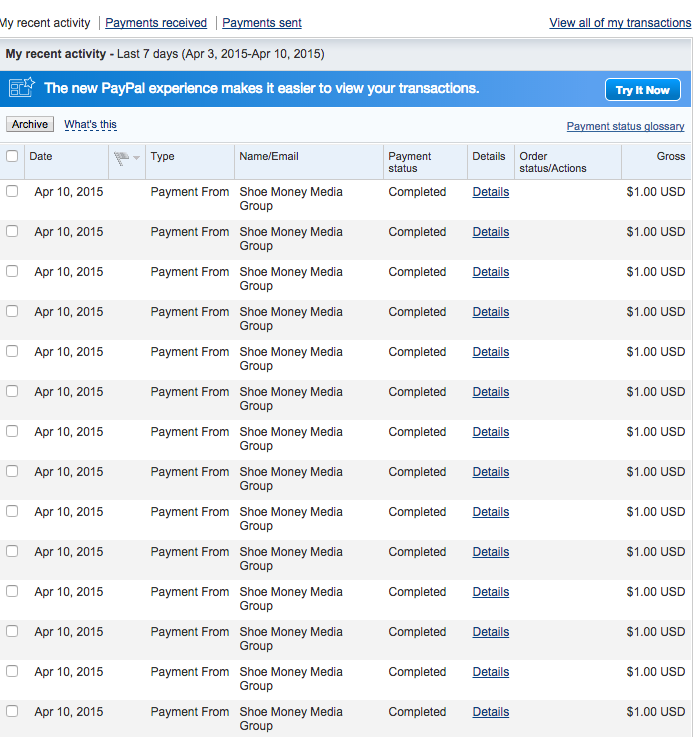 For each task that you complete the money is immediately sent to your PayPal account. It’s that simple. Joining the Shoemoney Network is free. You will never have to pay anything to Jeremy. But he will pay you as you progress. All you need is a PayPal account to receive your payments. The first task you complete will not cost you anything at all. And when it’s done, you get paid $1 instantly. That single task is something that maybe you do every day for free, now you can get paid for it for a change. That alone is a reason to join right now. Jeremy provides step by step training for people who don’t know where to start when it comes to making money online. All you need to succeed is a willingness to follow some basic instructions. At the end of this training you will have your very own fully functional website complete with facebook page and email newsletter. On top of that, Jeremy teaches you how to use your site to make money. It’s a great value! If you are just getting started, it will save you a lot of time figuring all these things out on your own. Isn’t it too good to be true? I can hear some of you saying, “it’s too good to be true. What’s the catch?”. Well, Jeremy says he is taking a risk doing this and he could lose money. He also says that his sponsors make it all possible. And I believe him. While you don’t pay Shoemoney anything, you still have to spend some money. While most tasks don’t cost you anything, completing all the tasks requires you to spend money. You have to buy hosting for your website and you have to do it with Shoemoney’s partner. In the end, you will pay for at least a one year hosting service. Be aware of that. If you don’t have the money, you will not be able to make it pass this task. You could spend less money if you did things slightly differently. Choosing a different hosting provider would save you money. Not a fortune but if you are on a very tight budget it could make a real difference. However, if you want to get paid by Shoemoney you have to do things his way which means using the company he tells you to use. The benefit of doing as Shoemoney says is that you get to move along to the next task and keep learning from him. The value he provides is worth the small expense. I guess it really comes down to whether you can afford it or not. It’s Jeremy Shoemaker’s network and his project and system. Therefore, he does as he pleases. After all, he is an internet millionaire and I am not. Nevertheless, I fell that he could have given people an option not to use his hosting partner. He could simply not pay them for the task if they hosted their site elsewhere. I personally would have taken that option. Actually I wouldn’t even have created a new site because I already have domain names and hosting that I can use for all this. It’s especially true when you consider how much I have made so far, $14. I could save more than $14 simply by using another hosting service. Well the fast cash is attractive. You really get paid as soon as you complete the task. It’s money that is available right away for you to use. Also, I am mostly interested in learning and applying what Jeremy is teaching to see how well it works for me. My goal is to make serious money online and I think that having a solid foundation to do so is important. And I hope that Jeremy will teach me how to do that. Another thing that is very specific to me and to where I am in my journey to make money online is setting up a newsletter. It’s one of those things that I knew I had to do but never took the time to. Now I’m finally actually setting up a newsletter. For me the benefits go beyond this one website that I’m setting up. It’s about learning these skills well enough that I can replicate them. Actually I’ve already used what I have learned from Jeremy on one of my other sites and the results are great! Hi, I’m Marguerite Jasmin and want to show you how you can make money online. I share with you what works for me so you can try it for yourself. Get Free Money Tips by Email! Signup now to receive an email with fresh tips for making money online. This entry was posted in Money Tip on April 27, 2015 by Marguerite Jasmin.